Laura went to Europe and all I got was this lousy sashimi?! It’s true – we’re headed out for a couple weeks. I will respond to any comments when I return. In the meantime…enjoy! serves 4 as an appetizer – we made the full recipe and split it into two for a nice, small dinner. Slightly adapted from Eric Ripert. * Get the wasabi paste in the tube if you can. The powder just does not have the same punch. 1. Combine the lime juice, tamari, and wasabi in a bowl until the wasabi is incorporated. While whisking, slowly drizzle in the olive oil to make an emulsion. Season with salt and pepper to taste and refrigerate while you prepare the rest of the dish. 2. 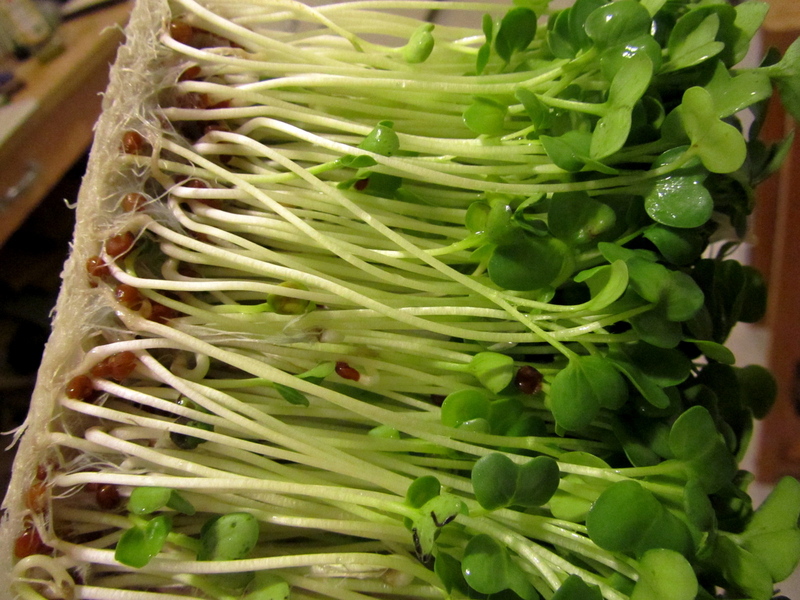 Gently toss the radish shoots with the green onion and set in fridge. 3. Season the tuna steaks well on both sides with salt and pepper. Heat canola oil in a pan at medium-high heat until it just begins to smoke. Cook tuna to desired doneness – these were on for about 1 minute per side. Move tuna to cutting board and cut into thin (1/4 inch) slices. 4. Arrange the tuna slices on 2-4 plates as shown. 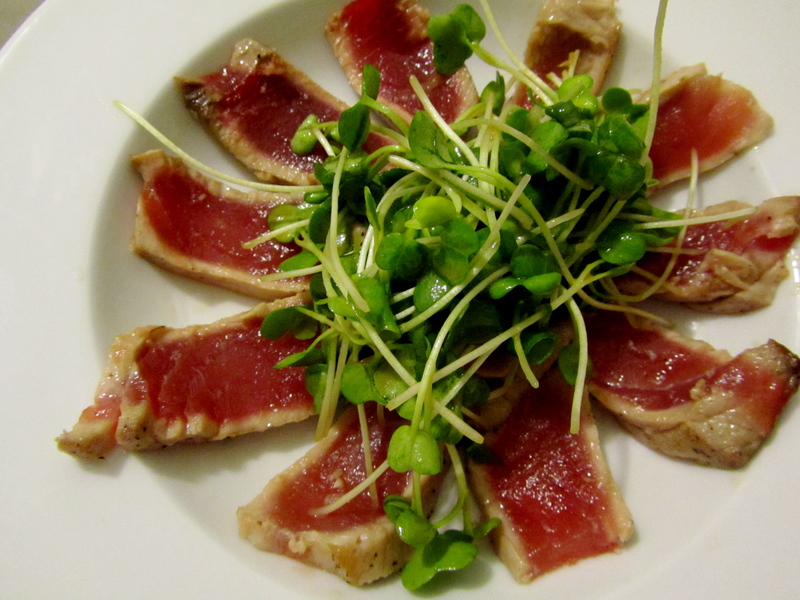 Toss the radish shoots and green onion mix with 2 tablespoons of the dressing and arrange in the center of the tuna pinwheel. 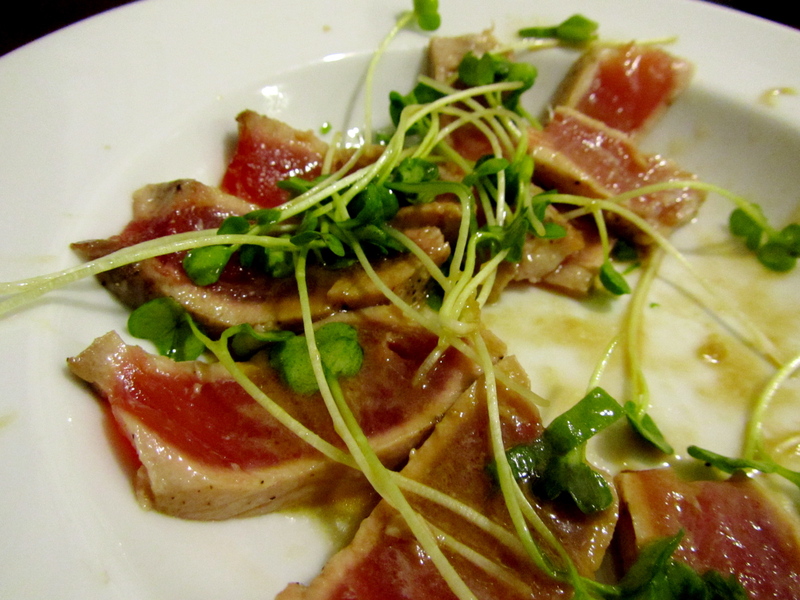 Drizzle a little extra vinaigrette on the tuna and serve right away – we ate it with chopsticks. The vinaigrette will keep for two days in the fridge, but you will probably try to think of lots of things that suddenly need a wasabi dressing and it won’t last that long! This entry was posted in appetizers, pescetarian, salad, seafood, sides and tagged ahi, sashimi, tuna, wasabi by Laura Zolnoski. Bookmark the permalink.